There are loads of beaches in Barbados, some are perfect for swimming, and others are great for skiing and paddle boarding. If you are looking for an action packed vacation that includes kitesurfing in Barbados, then you will need to visit one of these beaches! Kitesurfing in Barbados normally takes place at 3 different locations depending on the time of the year and the wind direction. This guide will give you all the information you need to know when you are planning to kitesurf in Barbados. This is the best location to kitesurf in Barbados. What makes it the best? Well for one, it has waves. While learning to kitesurf at Silver Sands beach is not the easiest place to learn, due to the crashing waves on the beach and the strong currents, once you do learn here, you’re well on your way to being able to kite just about anywhere in the world. The combination of the strong easterly trade winds, strong undercurrent and small beach for launching and landing really make this beach seem like a “kite-mare” waiting to happen. But trust me it will pay off. If you are a seasoned kiteboarder this is the place you want to go. Whether you ride a twin tip, directional/surfboard, or a foil, this place is a playground for all three. But yes, you can still learn this beach. Silver Sands beach is situated on the south east corner of the island in the parish of Christ Church. Getting to silver sands beach is also very easy. Local transport buses can bring you within a 5 minute walk to this beach. Alternatively if you have a car its pretty easy to find (you know, with google maps). What’s the wind like here? Well we are fortunate enough to have the north east trade winds steadily blow across our island all year round. Even though we do get some light winds from June – December (with the exception of passing hurricanes), you can still get in the water and kite with a foil during light wind days (more about foiling in Barbados later). The wind direction is generally between 90 degrees which is almost exactly east of Barbados. However, to catch Silver Sands on a great day its best to have the wind blowing around 100/110 degrees or as we would call it side-on. Using the right size kite for this location is also key. Depending on a few factors such as weight of the rider, skill level, type of board being used etc, for the most part any kite between 8m-10m is ideal. When the winds are around 17-23 knots I will use my 10m Cabrinha Switchblade kite for riding on my twin tip (I am 185lbs) but I could get away with using a 9m kite particularly if I’m riding a directional board. Since we have a broad range of wind speed its probably best to have at least 2 different size kites. 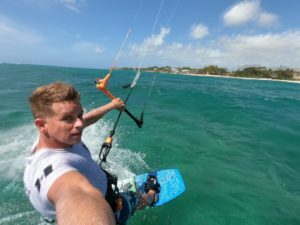 Here in Barbados, at this time of writing this post, there are no dedicated “rescue boats” should you run into trouble while kitesurfing. However, someone’s always watching out for you. Most local kitesurfers keep an eye out for each other and our visitors. For the most part if you’re a beginner its best to stay close to shore while learning, which most kite instructors/schools will advise you to do anyway. More recently there has been talk within the local kitesurfing community to band together to have a rescue boat available. Will keep you updated when and if that happens. When is the best time to “catch” the wind at Silver Sands? Well a couple things to consider. Always check the wind speed and direction the day before heading to the beach, this way you have an idea of what equipment you’ll need. As for the crowds, during the “winter months” in Barbados, expect to find as much as 40+ kites in the water, particularly between 9am-12:30pm. Most kiters will look to get out early and then be done by midday. Some will even stick around for a later afternoon sesh. But these are the best times to get in the water for an awesome session. If you are an experienced kitesurfer and enjoy riding waves, we have that here too. Silver Sands and Long Beach are great spots to have a blast kite surfing and smashing those “off the lips”, “cutbacks” and “gnarly floaters”. The swell at Silver Sands can get anywhere from 1.0m – 3.0m / 1.5ft-6ft easily. So there’s lots of fun to be had with the waves at both of these spots. Wondering where to stay that’s close to the kite spots? Well there are many options. Keep in mind Barbados is a small island and nowhere is really too far. However click the links below for places that are either close enough to walk from or a short 5-10 minute car ride. When kiting at Silver Sands, here are a few tips from a local. Always be aware of who’s around you. When transitioning, jumping or surfing waves, keep an eye out for other kiters close by or those that are moving towards you. Don’t just kitesurf here as if you are the only one. As mentioned earlier this spot can get very busy and as you are well aware when it gets busy like that the likelihood of an incident occurring is greatly increased. The pros of kiting at Silver Sands beach are that you have access to a fresh water shower after a kiting session (where you can also rinse off your equipment and there are also a few rum shops nearby to cool out and have an ice cold beer with friends or family. Some of the cons of kiting at Silver Sands are that its a difficult spot to learn at depending on conditions. When the tide is high the beach gets quite a bit smaller and its already small as it is (especially if its super busy). Sometimes there is not much room to lay our your lines without putting them over other kiters’ lines. There is not much safe areas for your significant other to relax on the beach where you are launching as there are lots of other persons doing the same. Kitesurfing at Sandals beach is an ideal spot when the wind direction shifts to a more on shore direction. It allows you to ride not quite perpendicular to the beach but riding up wind at this spot is easier than Silver Sands. Also the beach here is much longer and should you run into any trouble, its easier to end up back on the beach. This beach as the name implies is situated right in front of the Sandals Royal Barbados resort. If you happen to be staying at Sandals, and the wind is blowing on-shore, then you can score an awesome session right in front of your hotel. This kite spot is situated just off Maxwell Coast road on the south coast of the island. Approximately a 15 minute drive from the airport there are also many other hotels and guest houses situated within walking distance to this spot. The best time of year for kiting at Sandals is usually around March/April. This is when we tend to see the winds shifting a bit more, thus blowing more on shore making it ideal for here. Unfortunately you won’t find much waves to surf here, however, there can be (but not often) some decent swells that make their way closer to shore and provide for some fun but short rides. Also, this beach is almost never packed with kiters, so if you happen to score some ideal conditions at this spot, you may end up sharing the spot with not more than 5 or 10 kiters max. The beach here is big and beautiful so if you’re significant other wants to just relax on the beach, he/she can do so without being in the way of dangerous kite lines. Ideal equipment for this location would be a 9m, 10m or even a 12m kite and a foil board. If you ride a foil then this spot is a super fun place to launch from and allows you to cruise up and down the coast and into the Oistins bay area. If you ride a twin tip, you can also have a super fun session here as there can be some small wind waves a few yards off the beach that make for a good launch to do some tricks. Unfortunately if you are riding a directional board, then you may feel like you’re just “mowing the lawn”. Long Beach as the locals call it, is a beautiful 1/2 Mile beach just south of the airport. From this location you can literally watch the planes as they take off from the runway and make their way into the friendly skies. Trade winds flowing directly across the Atlantic unencumbered make this kite spot a fun place to jump, do back rolls, front rolls, massive airs, and even smash those off the lips. When the winds hit 20 knots and start to blow from the east north east, Long Beach is the go to spot for some great kiting fun. However, be prepared its not the easiest spot to find. Whats great though is that the beach is usually really wide and because its quite long there is plenty of room for kiters to run their lines and setup their gear. From long Beach some locals even do downwinders where we park one vehicle at our destination and shuttle a few kiters to the start point and just have fun kiting down wind. A couple of fun downwinders would be from Long Beach to Silver Sands, from Silvers Sands to Sandals and then for the more experienced kiter, from Silver Sands down to Drill Hall Beach (approximately a 10km downwind kite experience). A few things you need to be aware of about kiting at Long Beach: There are very sharp jagged rocks on the southern end of Long Beach. If you are a beginner don’t start near those rocks. Make your way far up the beach and give yourself plenty of space as you will end up close to those rocks when learning. For the intermediate kiter, the same applies, but you should be able to ride back upwind to your original start point so it shouldn’t present too much of an issue. For advanced kite riders, you can start closer to the rocks, but as always, just be mindful and try to avoid kiting too close in the event anything should happen. The great thing about learning to kite at Long Beach is that when you hit the water and start your first run, if you have any trouble making it back in, at least for the most part the beach is big and long so it can be very forgiving and the currents and wind will blow you back on to the beach, unlike Silver Sands or Sandals beach. You can access the beach quite easily by car. Once you find an area to park its usually a few yards and you’re right on the beach. On piece of advise is do not leave any valuables unattended at this beach. Its quite an isolated area and its better to be safe than sorry so don’t leave any valuables laying around on the beach. Also be sure that if you drive a car to lock any thing value the trunk of the car.